The versatility of Quonset huts makes them ideal for a wide array of uses. Whether you need a quonset garage, workshop, storage building, steel shed or more, quonsets are durable, affordable & virtually maintenance free. Why Choose a Quonset Building? Please share a little about your building needs for a free quote from our network of top Quonset providers. From hay storage to riding arenas, quonsets are ideal for agricural and farming uses. 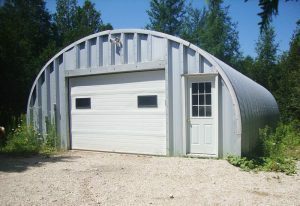 Customize a quonset garage that's sized for your needs. Feel free to add a little extra storage in. 100% useable space for whatever projects you have in mind and tools you want to store. 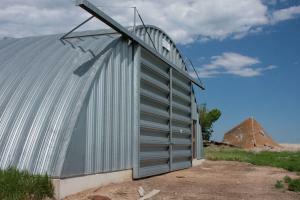 Quonset storage buildings help protect your investments & can be custom sized for your needs. All the storage space you could ever need. Quonsets also make expanding easy. Simply add arches. The durability and affordability your business needs. Quonsets offer 100% useable space. Quonsets make a strong, affordable starting point to customize the house of your dreams. Perfect for any new or established business. Ready to protect your asset & help you grow. The bolt-together arch design truly does make most quonsets a DIY project. Large industrial warehouses or other large-scale buildings may be better handled by a professional due to the height you will be working at. One part you may want to consider a professional for, is the foundation. A factory engineer can discuss those requirements with you. Do they Come with a Warranty? Due to the durability of this style of building, most buildings will come with a warranty from either the manufacturer or distributor. Be sure to read the details of your warranty agreement carefully since coverage will vary. Typically Quonsets will be warrantied against manufacturing defects, along with 'rust perforation' warranties which mean they are protected against the panels rusting through. The warranty period will vary from one manufacturer to the next, however, the industry standard is a 25-35 year warranty. Some situations such as proximity to salt water and other factors may affect your coverage so ensure you review all details with your representative. 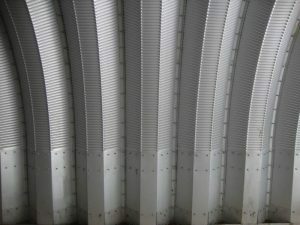 The cost of a quonset can be a bit of a loaded question so we always recommend speaking with a building consultant, and it's the reason each building must be quoted individually. additional elements such as wiring, plumbing, foundation baseplates, etc. We recommend requesting a quote here and finding a supplier who can provide the best price for your steel building. Quonsets have been made with a wide variety of metals throughout history, but these days the majority of North American quonsets are made using GalvalumeTM steel by Arcelormittel. Can I Insulate My Building? Manufacturer insulation kits - These make insulation easy. It includes a layer of insulation, a plastic backing to nicely finish off the look of your walls and pins which hold the insulation in place. Spray Foam Insulation - Spray foam is a bit more expensive, but it has a high insulation rating. This method is exactly what it sounds like and a technician will use a spray gun to apply layers of insulation to the interior of the building. What Snow Loads can they Handle? Quonset huts are engineered to meet the snow load requirements of your local building codes and conditions. Typically buildings can handle a load of around 20lbs, however, it can be engineered and gauged to accommodate any requirements. Be sure to speak with the factory engineer regarding your local building requirements. How Thick is the Steel Used? The thickness of steel is called it's 'Gauge'. It may seem counterintuitive, but the higher the gauge, the thinner the steel. 10 gauge is 3.416mm thick and it gets thinner as you go up in gauge. Quonsets typically come in 22 gauge steel. You can rest assured that even at this gauge the steel is incredibly durable and isn't something you could ever bend by hand. If you live in a region with high snow loads, wind loads, or other building code requirements, then a thicker gauge of steel is required including 12 gauge. While painting is not required, the building can be painted. Many manufacturers also offer factory painted panels in many colours. We always recommend going with the factory painted panels since the quality of the paint used and factory-application ensures a long low-maintenance life. If you are interested in factory painted panels, be sure to inquire if the paint is warrantied. Often factories will guarantee the pre-painted panels and offer warranties as long as 40 years. This varies by municipality, but in most cases yes you will need a building permit. Most regions do not require permits for buildings which are under 10 square feet. There may also be a loophole where they do not require permits for temporary buildings so you may be able to make a case for the building being temporary if you install it on a movable foundation like railway ties. A building consultant may be able to answer this question for your specific location, based on their past experience but we always recommend speaking with your local building department. Why are Quonset Hut Buildings so Popular? Quonset buildings have become a popular choice for canadians over the past decade, and with good reason. While initially designed for military use during WWI, they’re now used for a variety of purposes from residential garages, workshops, and storage, to large scale barns, factories and warehouses. Quonsets are made of 100% steel and that offers almost unparalleled durability and resistance to the elements. This is an important thing to keep in mind for us Canadians since large snow loads can wreak havoc on many building types. When you speak with a building representative, they should work with a factory engineer to ensure that the thickness of your building is appropriate for your local wind and snow building codes. 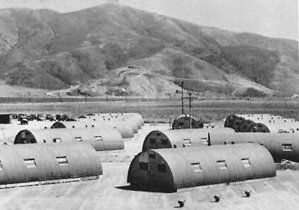 Quonsets were initially designed by the navy to be quickly assembled in any conditions. Because of this they offer simple bolt-together construction which saves you headaches and money. 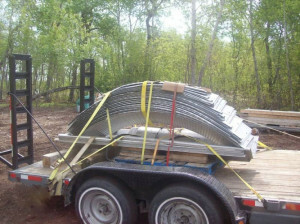 If you’re a do-it-yourselfer then it’s entirely possible to put together a medium sized steel quonset building in a matter of days. The panels come stacked in a pile and once your foundation is prepared, all you need to do is basically bolt them together with a simple wrench. No special machinery is required. Over the years quonsets have evolved and you can now get a variety of different shapes, along with the classic arch metal building style. They can be manufactured for essentially any size and also come with a wide array of accessories like vents, windows, doors, sunlights, and more. Not liking the steel look? No problem! Most metal building factories will offer pre-painted panels in a variety of colours. With most building projects, saving money is key and that’s part of the reason so many choose metal quonsets. The clear-span arch design means very little material is actually needed and this allows you to save both on the building itself and on additional charges like shipping. You also save money on construction due to the fact that it’s so easy to assemble. Even if you don’t build it yourself, a contractor will make quick work of it. Finally your long-term costs are lower because of the low maintenance costs of a metal building.